Last Friday, I featured a photo of the Nickelback concert at the Bradley Center. 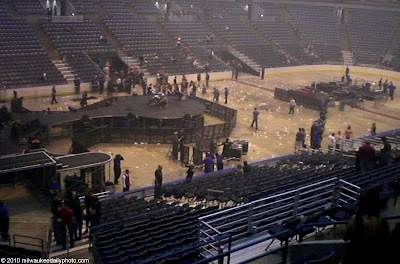 Today's photo is what the arena looks like 10 minutes after the show is over. The building is devoid of fans, the tear-down crew has already begun the job of getting the show to its next stop, and the cleanup of all the trash left behind is underway. Only the haze of the pyrotechnics remains in the air.